Note: This is the first in a series of posts this week about the swine farm buyout program, which will culminate in a larger story Thursday morning. The coverage will include maps of more than a dozen counties and the locations of their flood plains and hog farms. Today’s installment gives readers a brief background on the program, which started in 1999, but has not been funded since 2007. 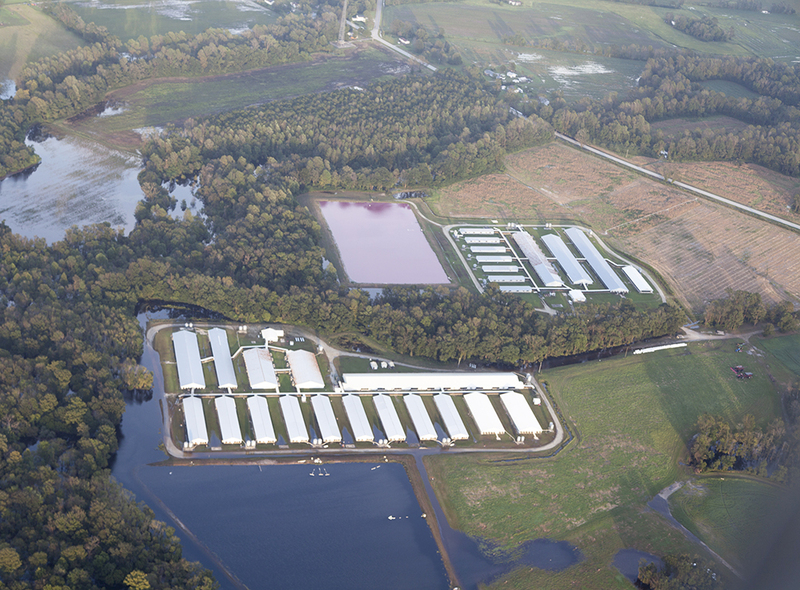 After 11 years and two major hurricanes, the state is resurrecting its chronically underfunded swine farm buyout program, which pays farmers to close their hog operations that are located in the 100-year flood plain. An NC Department of Agriculture spokesperson told Policy Watch the agency plans to open the next round of applications later this week. The buyout funds are used to close lagoons, decommission farms, purchase swine production and development rights, and establish conservation easements in areas prone to flooding. The program is voluntary and intended to reduce environmental damage, particularly to waterways, from inundated lagoons. The farmers can still plant row crops on that land or raise livestock on pasture. The program launched in 1999 after a trifecta of hurricanes — Dennis, Floyd and Irene — pummeled North Carolina. Since then, the Clean Water Management Trust Fund has allocated a total of $18.7 million in grants in four rounds of buyouts: 1999, 2001, 2004 and 2007. The federal government chipped in another $941,000. Scroll down for a spreadsheet of the funding totals per county. But no state funding has been available for buyouts since 2007. Since then, two major hurricanes and eight minor hurricanes or tropical storms have flooded parts of eastern North Carolina. 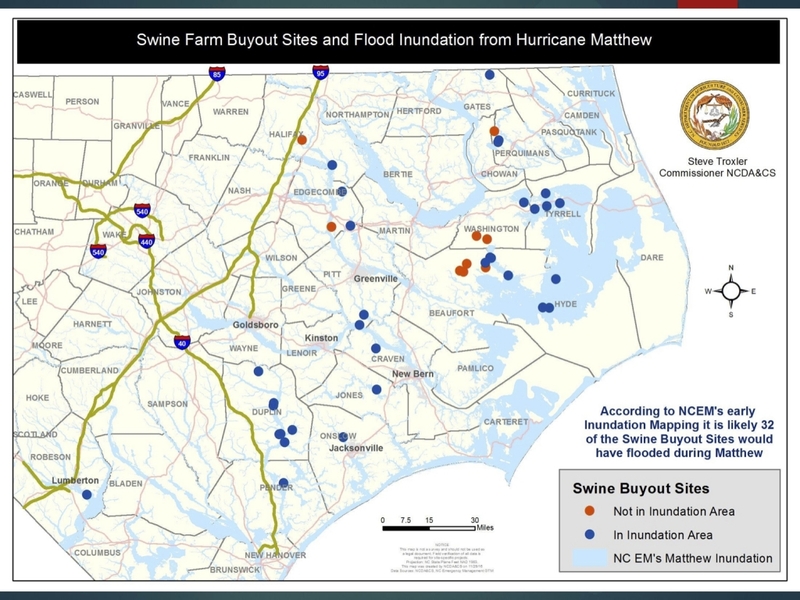 And last month, 46 lagoons in eastern North Carolina were flooded, discharged wastewater into adjacent land or streams, or sustained structural damage as the result of Hurricane Florence. At least another 60 nearly overtopped, according to reports from the farmers to state environmental officials. In April, the federal government awarded the state agriculture department nearly $2.5 million for the fifth round of buyouts. Agriculture Commissioner Steve Troxler secured another $2.5 million in state funds, bringing the total to $5 million. However, that money doesn’t go as far as it used to. For example, in 2001, the state spent $5.4 million to buy out 20 farms. In 2007, though, the state spent nearly $2.5 million for just four farms. 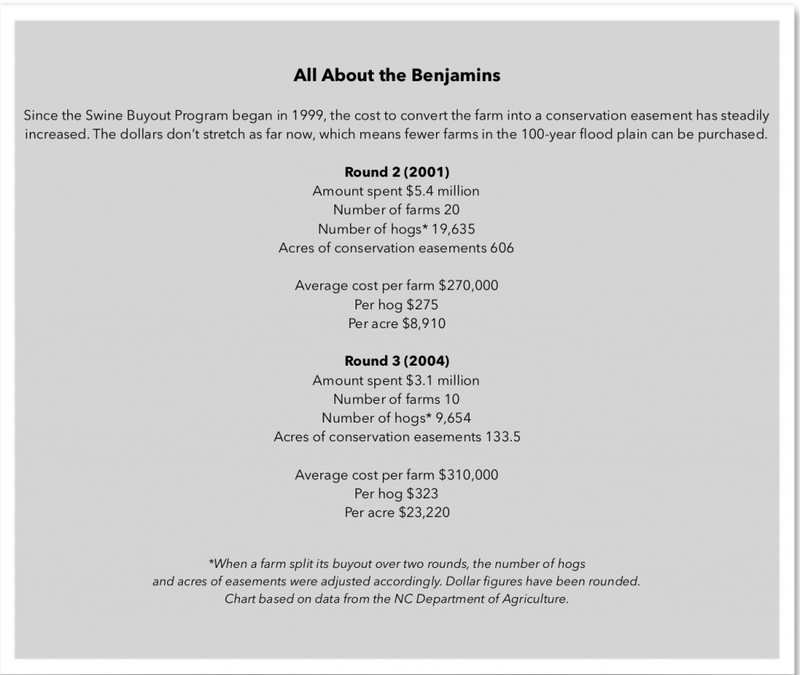 The increase in purchase prices is due in part to the price per pound of live hogs, which nearly doubled between 1999 and 2007. Even with $18.7 million, the state still can’t meet the demand for the program, according to a 2016 presentation given to the legislature by David Williams, deputy director of the state Division of Soil and Water Conservation, shortly after Hurricane Matthew. The program has accepted just a third of the 138 producers who submitted applications — 43. The applications are ranked based on several criteria: the facility’s history of flooding, distance to a water supply or high-quality waters, structural condition of the lagoons and the elevation of the hog barns and lagoon dikes to the 100-year flood plain. A 100-year flood plain is defined as an area that has a 1 percent chance each year of major flooding in any given year. A 500-year flood plain is where the annual chances are 0.2 percent. In the table below, farms that received payments spread over multiple years were counted only once, as were their hogs and acreage. The data was current as of 2016, when this update was presented to the legislature. Farms whose payments were split over two rounds of funding were counted only once.